March 31st marks the end of our third quarter this year. I can not believe how quickly the year has passed. I'd be lying if I said I wasn't nervous about covering all the material in this year's syllabus. Next year, I'm not planning on being so ambitious. For the remainder of this year you'll notice a little bit of a change in our units, to ensure that I cover everything. Each unit will have about 1-2 themed activities in each subject area. This way I can cover more in a shorter period of time. Activities on our shelves this week include our dental unit, eye unit, and pharmacy unit. Each set of themed activities will be covered in a separate post. The only exceptions to this plan include continent unit studies and our first Walt Disney World Unit at the very end of the school year. We've had so much sickness in our home this school year. Since January alone, the kiddos and I have been sick for about a week each month. Right now we're battling fevers and coughs. Yuck! Despite being a small unit, I'm super excited about our dental activities. Their timing is quite bizarre. Bulldozer just lost his second tooth and had a dentist appointment on Tuesday. I just found out that I need to either have a root canal done and crown put in, or an extraction. This is due to complications and horrible pain after a filling that turned out to be far more complicated than expected. Learning more about teeth has been a bitter sweet experience. 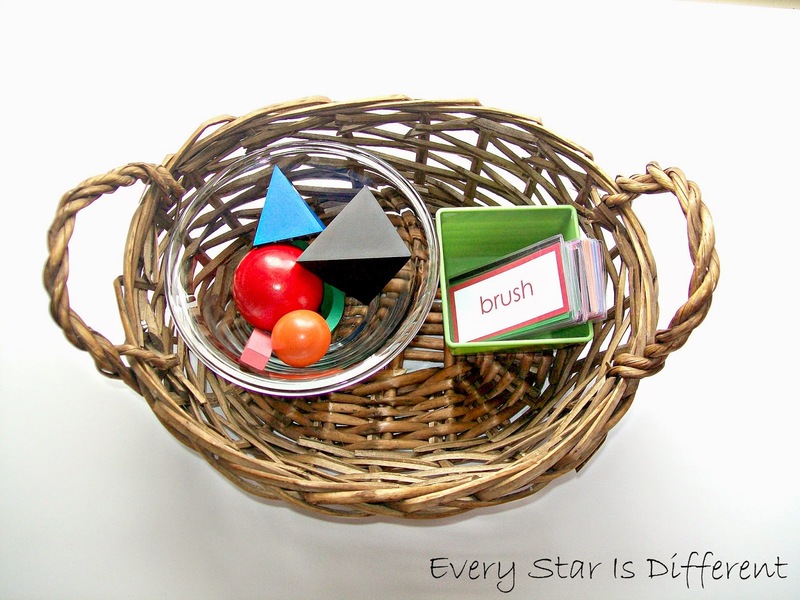 The kiddos will sort words, placing them under the correct Montessori grammar symbol. This will be the first time that we'll work on distinguishing words that can be used as nouns and verbs. 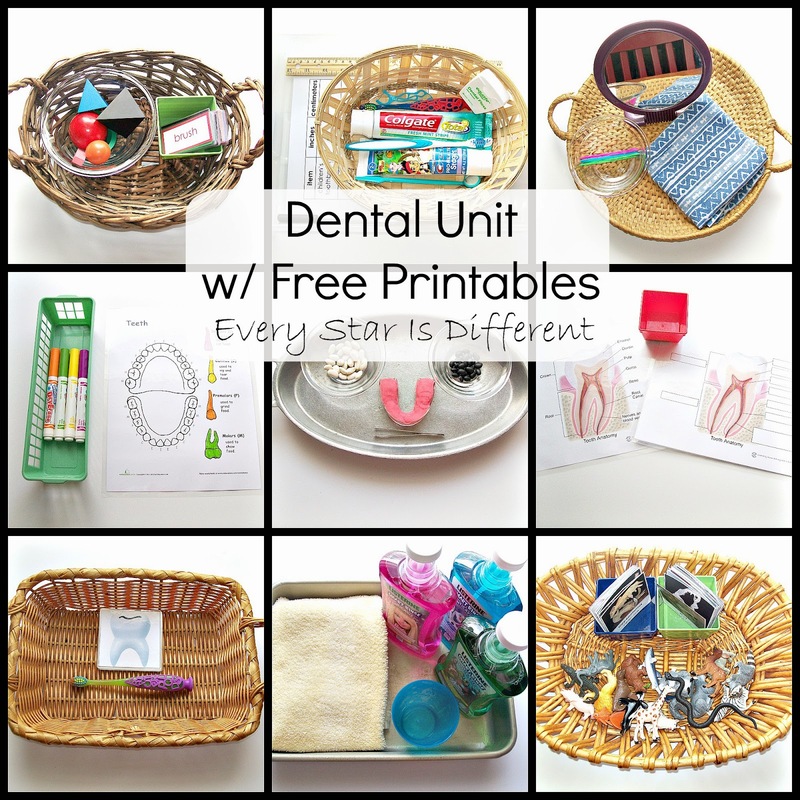 Source: I created the printable for this activity as part of my Dental Unit Printable Pack 1. For your free copy, click on the link a the bottom of this post. The kiddos have become quite proficient at measuring inches, but have yet to be introduced to centimeters. In this activity they are given a ruler with both types of measurements. They will measure each supply in inches and centimeters, recording their answers. I'm super excited about this activity. Jason and I created animal cards showing different types of teeth. 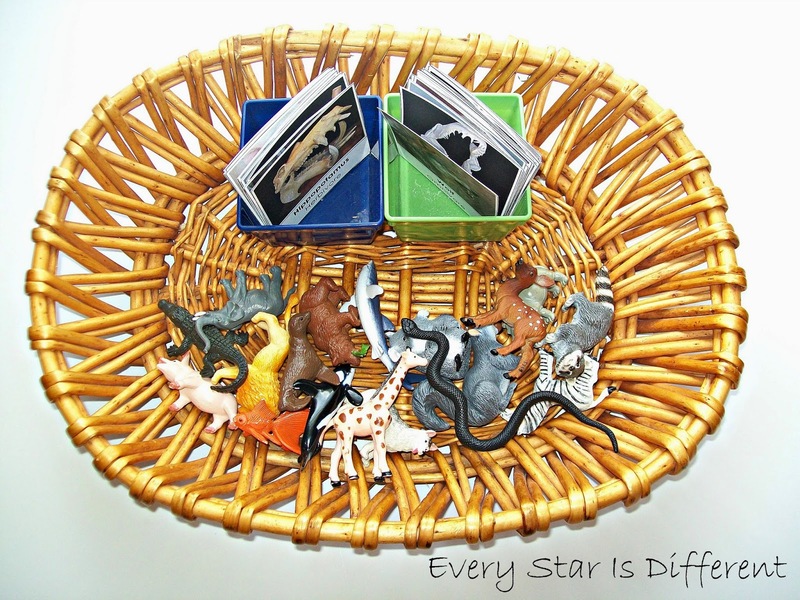 The kiddos can match the animal teeth to the animal cards, placing the animal figures on top of them, or they can simply match animal figures to animal cards, depending on their levels and abilities. For Dinomite, who is quite advanced in his knowledge of animals, the cards can be sorted by eating habits: herbivore, omnivore, and carnivore, which are notated on each card. 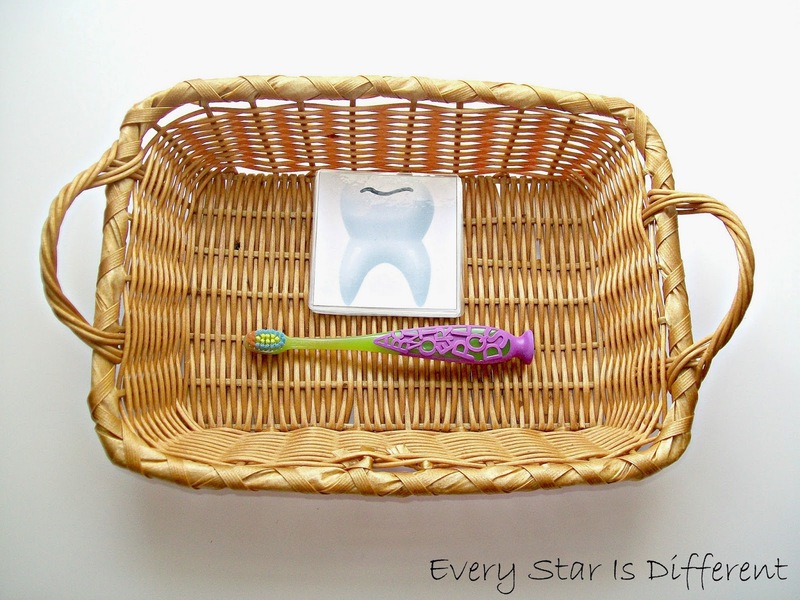 The kiddos will use the control provided to help them fill in the missing labels of the tooth chart. The kiddos will use the code provided to color the teeth model, while learning the names of the different kinds of teeth in their mouth. 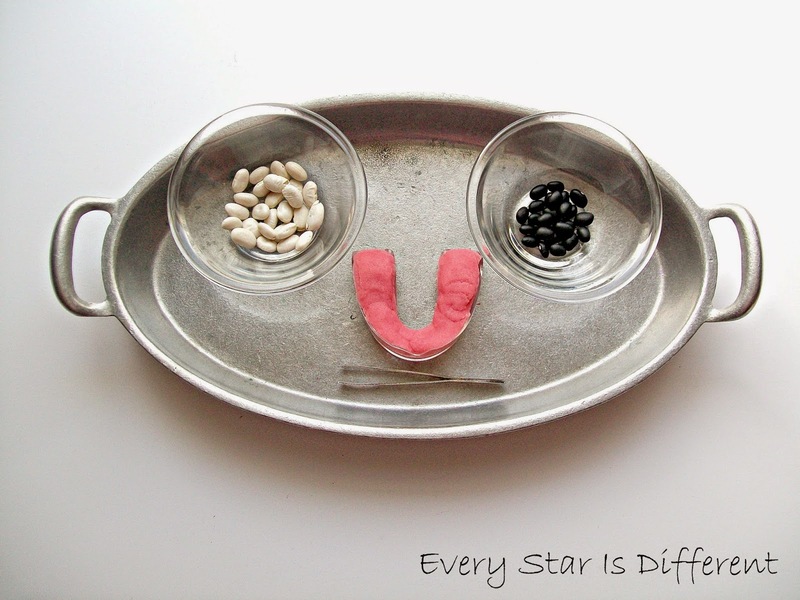 Source: The free printable for this activity can be found at education.com. For the most part, the kiddos do very well brushing their teeth. Princess even goes as far as using a timer, to ensure she's brushed for an extended period of time. Each of them knows to brush morning and night. Bulldozer is the only one, out of the older three, who still needs help at times. He loves to chew on his brush instead of brushing with it. I'm hoping this activity will help him understand why it's so important to brush. Six cards are included in the activity with different dirty spots. 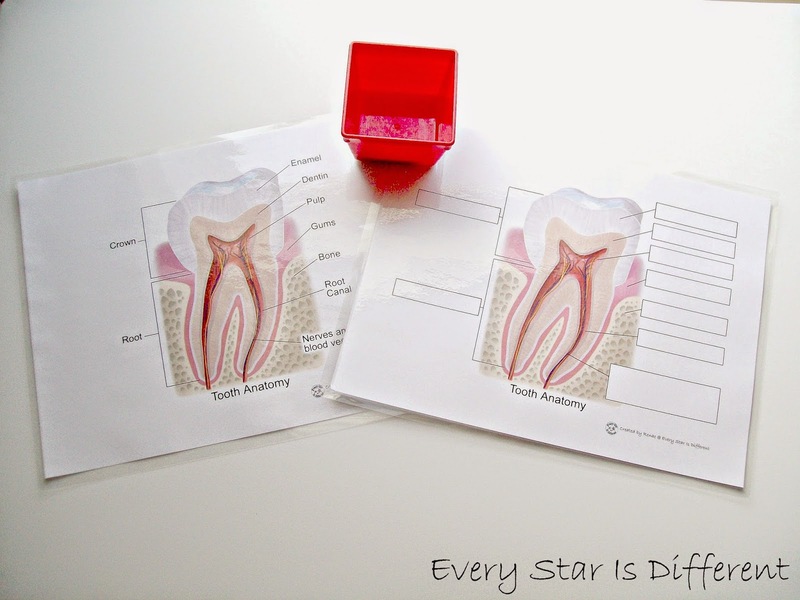 The tooth cards have been laminated and colored with a dry erase marker, to ensure easy brushing. 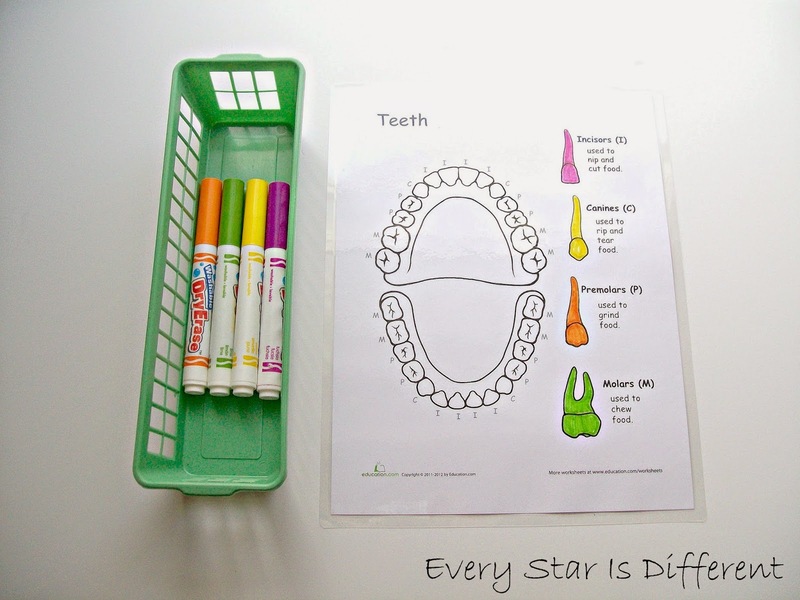 I'm guessing this activity will be quite popular on our shelves, as the kiddos are able to have fun building a mouth full of teeth and then pulling them. I've used a clear mouth guard as a mold and filled it with pink play dough. White beans represent clean healthy teeth. Black beans represent rotten teeth needing to be pulled. Source: I've seen variations of this activity all over the internet from various sources. At the kiddos' last dental appointments, the dentist mentioned it was time for them to start flossing regularly on their own. 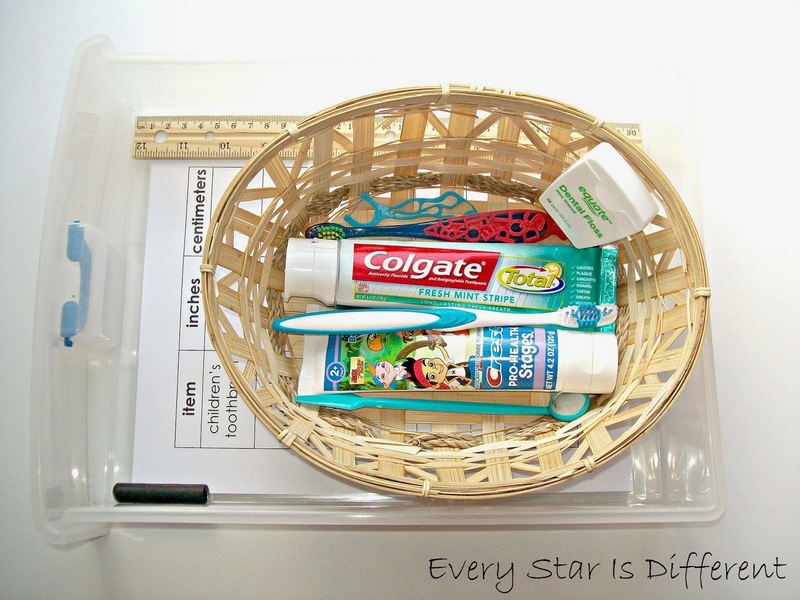 I thought this unit and activity would be a perfect way to introduce them to the concept and have them practice flossing on their own. 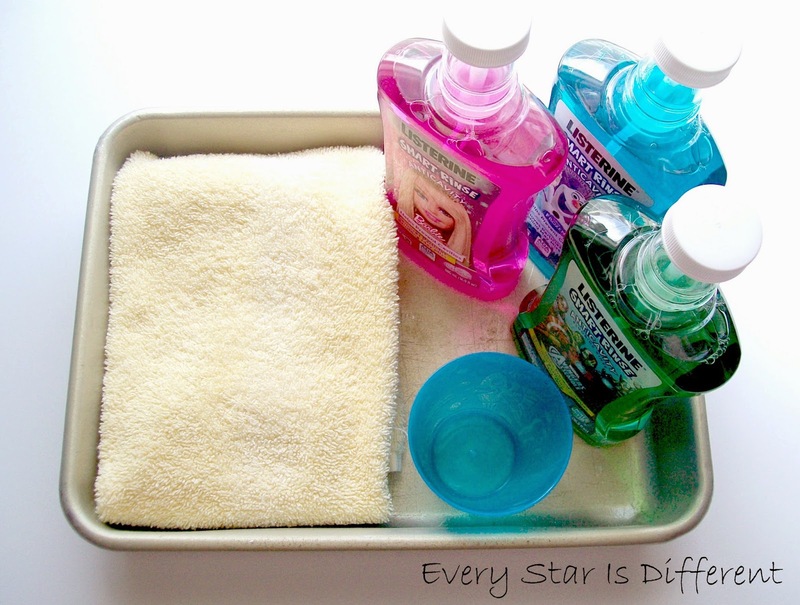 The dentist also mentioned the kiddos were ready for mouthwash. I decided before I attempted to choose a flavor on my own, I would let them test a few children's flavors out. Each day they'll select a new flavor to try out, measuring out the correct amount, pouring it into the cup, putting it in their mouths, swishing it around, spitting it out and wiping their mouth when finished. (I probably could have made step by step cards for this.) Hopefully by the end of the week they'll each have a flavor they like. If I'm lucky they'll all like the same one! While resting on the couch with no energy, we've been enjoying a few new books from the library related to our unit theme. They're super cute! I hope you look forward to seeing our eye care and pharmacy activities coming soon! Love the animal teeth matching activity!! So much fun! You have an amazing imagination. I wouldn't have thought of pulling teeth or matching animal teeth. Reading your blog has really inspired me to think outside the box more. I can't wait to see what you come up with next. I LOVE this post! So many great resource ideas! 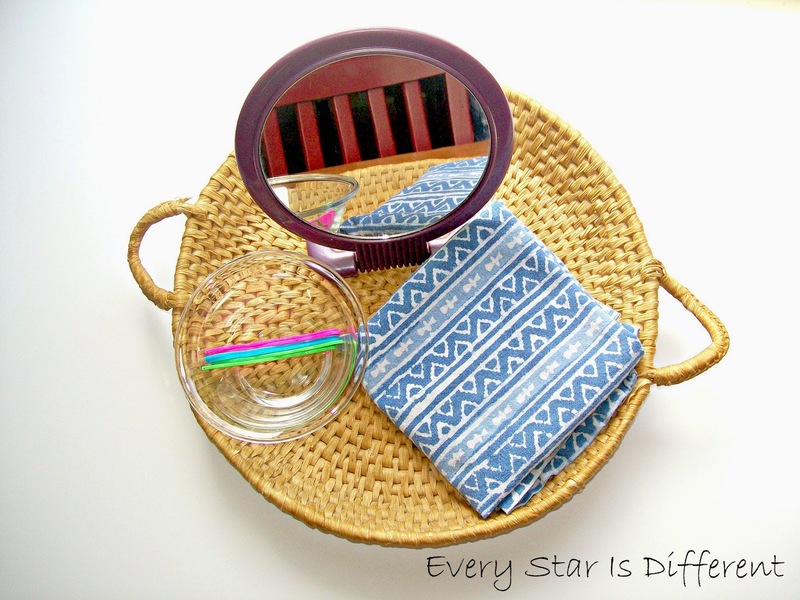 I'm interested in learning more about Montessori grammar so thank you for the printable.